A phobia of flying is common. But nervous travellers can try to overcome their fears and settle their nerves ahead of taking to the skies with the help of some well-travelled professionals. Hundreds of thousands of people are expected to be packing their bags, checking their passports and travel insurance documents, once, twice, and probably even thrice, in a bid to see faraway loved ones over the festive period. So now is a particularly good time for infrequent and regular flyers to reassure themselves with some top tips from British Airways pilot Captain Steve Allright. 1. Turbulence - Probably one of the biggest concerns that can leave even a steadfast flyer feeling a tad uneasy, turbulence is a "normal part of flying". Captain Allright says that while it's uncomfortable, it is not deemed dangerous. "It is a perfectly normal part of flying caused by nature", he stresses. 2. Breathing - Learn how to control your breathing and you could vanish your anxious feelings away. Hold your breath, then take a long deep breath in, followed by a long deep breath out. Continue long, deep breathing. 3. Muscle contraction - Alongside your breathing techniques, clenching your buttocks is an effective way to stem the jitters as it overrides other nervous signals going up and down your spinal cord. 4. Up, up and away - Aircraft, like pilots and cabin crew, actually like to be in the air, says Captain Allright. "It is a very normal, safe environment for them to be in." 5. Trust the wings - It's this part of the plane that enables it to fly, not the engines, Captain Allright points out. Even without the engines, a commercial aircraft at 30,000 ft can glide for 100 miles. Phew. 6. Things to do - Breaking up a long-haul flight by watching a film, writing a letter, reading a book or eating a meal can help make the time, well, fly by. 7. Safe hands - It's not easy to become a pilot, and as well as a rigorous selection and training process, those at the helm are subjected to simulator tests every six months. 8. Check, check, check - Commercial aircraft are well maintained and pilots and engineers carry out inspections before the wheels ever leave the ground. Routine maintenance is also conducted at regular, specified intervals by licensed engineers. 9. Rule-abiders - Air traffic controllers are trained, licensed and follow a very strict set of rules - as do the pilots. 10. Happy ending - Calm yourself by picturing the end of the journey and the moment you greet your family and friends in arrivals. Visualising warmer climes can help too. 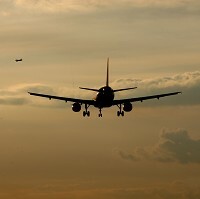 Run by trained pilots and cabin crew, it will inform you on how an aircraft operates, turbulence and offers advice and relaxation techniques from clinical psychologists.